Kimbe Bay is a large marine protected area on New Britain Island in northern Papua New Guinea. 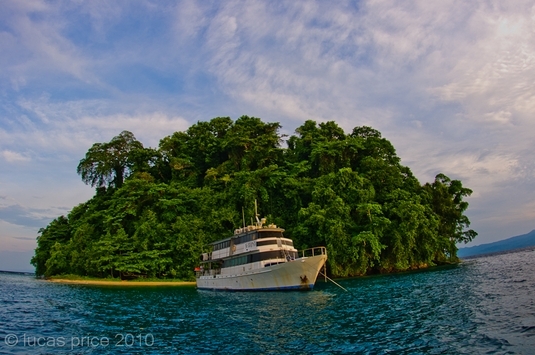 Kimbe Bay is serviced by Walindi Plantation Resort, the MV Febrina, and Peter Hughes Star Dancer. 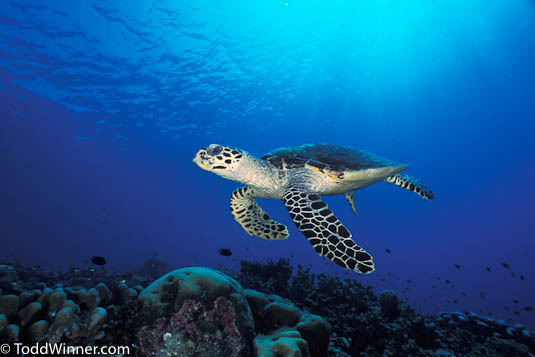 The Witu Islands is one of a handful of itineraries that liveaboards run out of Kimbe Bay. 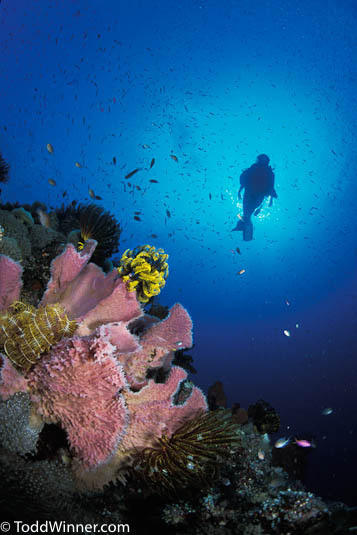 Both Kimbe Bay and the Witu Islands have large schools of fish, stunning soft corals, reef sharks on most dives, occasional tunas and other pelagics, and calm shallow hard coral gardens. The reefs themselves seem almost perfectly preserved other than small amounts of coral bleaching brought on by this years La Niña (less than 1% of the visible coral by my estimation). Both liveaboards also run itineraries to other island groups departing from Walindi Plantation Resort that get equally good reviews. The exact itinerary on any given trip is determined by the Captain according to weather conditions and diver desires. The steep walls and soft corals of Kimbe Bay provide many opportunities to frame the sunball behind subject. Taken with a Nikon D300, Tokina 10-17mm fisheye lens. 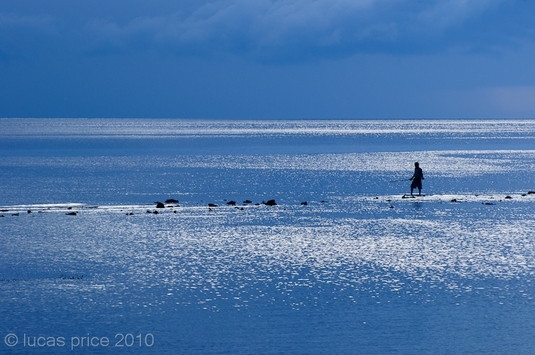 A local fisherman early in the morning. Nikon 70-300mm lens. 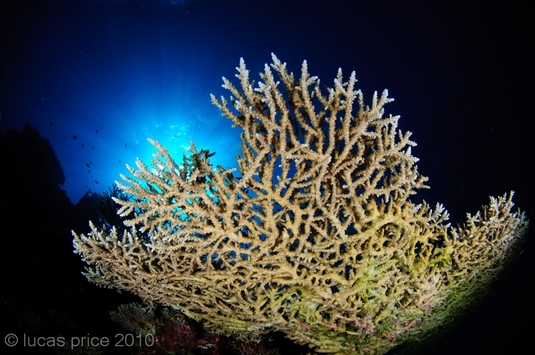 Perhaps the most photographed site in all of Papua New Guinea, Susan's reef provides excellent underwater photo opportunities in both macro and wide angle. Susan's reef is made up of two sea-mounts that rise close to the surface connected by a saddle between them. The top of the shallower sea mount is approximately 15 feet deep. On my visit, there was both a bargibanti pygmy seahorse and a denise pymgy seahorse present. But the real highlight of Susan's are the wide angle opportunities. 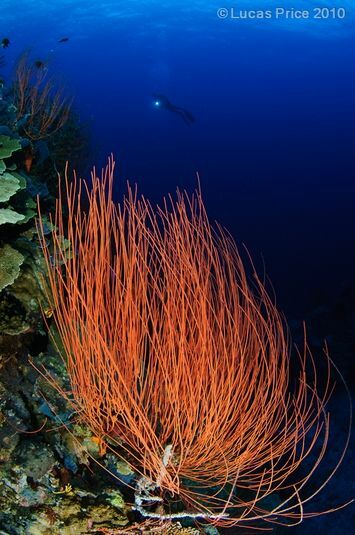 One large section of the reef is filled with photogenic pink sea whips along with the normal array of anemones, sea fans, and soft corals. 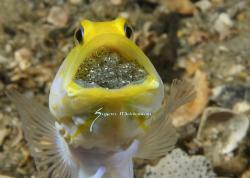 And when there is a little bit of current small fish dot the entire reef. Susan's is not to be missed. Susan’s reef’s spectacular red corals make for great photos. Tokina 10-17mm lens. 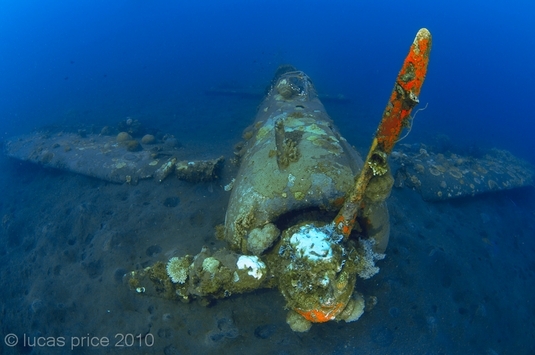 A fully-in-tact Japanese fighter plane from World War II, the Zero Wreck is a memorable site. This site is closer to shore than most sites in Kimbe Bay and visibility can vary. But on a good day the wreck can make for some fantastic photos. 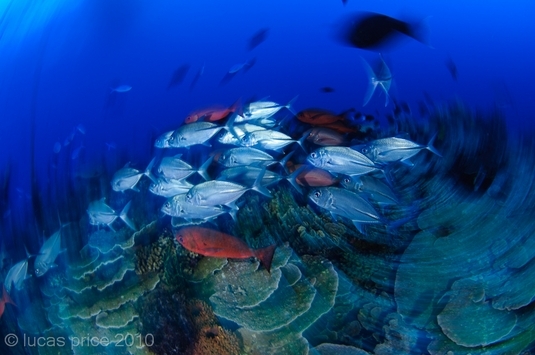 When the visibility is sub-par there is also some reef nearby that has an array of critters underwater. A fully preserved WWII Japanese fighter plane provides an unforgettable photographic subject. Tokina 10-17mm lens. Read more about wreck photography. South Emma is a sea mount that approaches the surface and has lots of action on it. Reef sharks are common as are schooling jacks and barracudas. 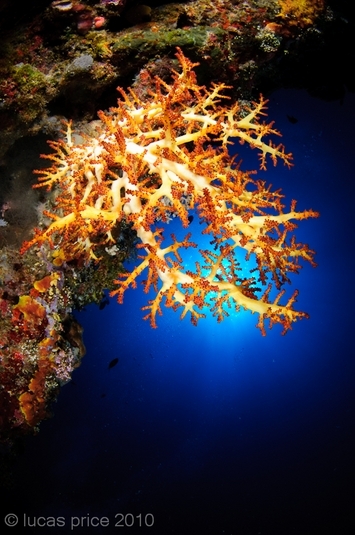 Perfect hard corals are near the top of the reef, and soft corals and sea fans are on the steeper parts below. Excellent for reef and schooling fish photos, but with the right guide there will be no problem finding critters to shoot with a macro lens also. An island that is popular for dive boats to go ashore for lunch, it also has some good dive sites. A resident giant barracuda and some black tip reef sharks populate healthy reefs that have good split shot, wide angle, and macro opportunities. 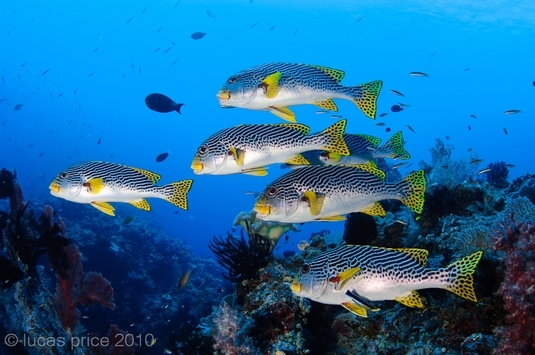 Colorful school of oriental sweetlips. Tokina 10-17mm lens. Alan Raabe, Captain of the MV Febrina says, “Krakafat is the reason to visit the Witu Islands”; he knows what he is talking about. Similar to other sites in the area there are schools of batfish, baracudda, and jacks. 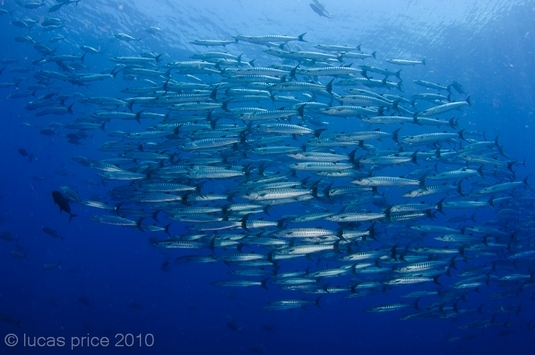 But the quantity and density of the fish at Krakafat are unparalleled. Opportunties abound to get photos of soft corals with schooling fish in the background, and photos of unafraid batfish. Keep your eyes out for sharks and tuna cruising by the reef. 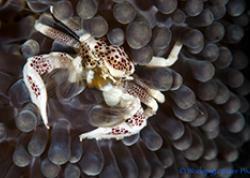 A great macro site where you might find seahorses, ghost pipefish, shrimp, “nemo” fish, and an assortment of other critters. 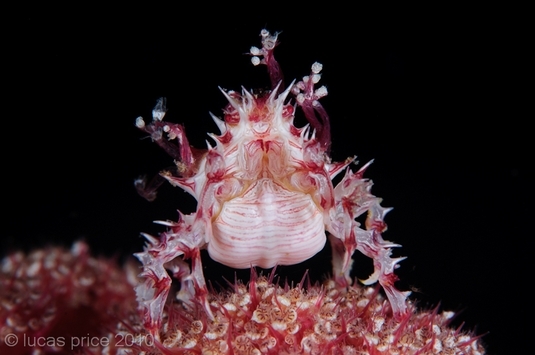 The local dive guides work hard to make sure that macro photographers go home with good shots, like this soft coral crab. Nikon 105mm lens with Subsee +10 diopter. Another macro site where you never know what you will find. Beautiful above and below water, be on the lookout for octopus, ribbon eels, mantis shrimp, and a handful of species of anemone fish. This black sand bottom on this site allows good backgrounds and the ability to position yourself below your subject without damaging corals. Kimbe Bay and the Witu Islands have lots of opportunities for both macro and wide angle photography, but wide angle shots are the truly world class opportunities in the area. Dive guides will provide guidance to suggested lenses and subjects, and they know what they are talking about. Lots of communication both before and during the dive with local guides will make a big difference in getting the best of each site visited. 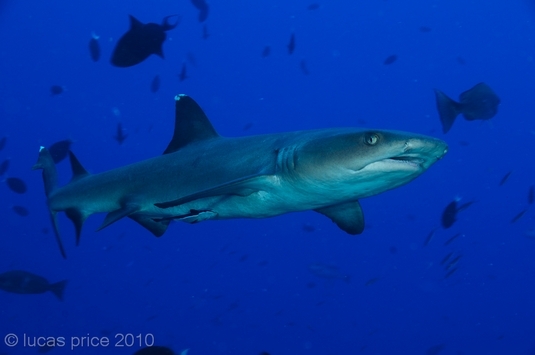 White tip reef sharks are on many sites. Sigma 17-70mm lens. Read more shark underwater photo tips. When the sun goes away while at depth, it is a good opportunity to play around with slow shutter shots underwater. Tokina 10-17mm lens. This anemone made for a good subject because it was on the edge of a dropoff that provided easy access without damaging the reef. The boat is smaller than some other liveaboards, but well laid out. The cabins and dining area are very comfortable, and each diver has a good sized cubby hole on the dive deck to keep personal items between dives. Camera tables are comfortable and spacious enough for four or five photographers at a time. Captain Alan is an colorful and interesting personality. He sometimes walks a fine line between humorous and being politically uncorrect, but his stories are always captivating. He has years of experience and truly knows the area. The dive crew was fantastic, and as they got to know our diving habits they went out of their way to make sure that each guest had his wishes fulfilled. One dive guide in particular, Digger, always aims to please and will spend every dive zooming around from one part of the dive site to another mentally lining up your next photographic subject. As soon as I would look up from one subject, he would often be waiving me over to look at something else. The diving is done from the dive deck, not dingies. So at the end of each dive, it was necessary to navigate your way back to the mooring line. They do have a dingy to go after divers that get blown off of the site by strong currents, but we never used it during our trip. I prefer that dingies follow divers and pick them up at the end of dives, but they have put mooring lines in the middle of the dive sites, so the extra swimming to get to the dive site and back to the boat is only a minor annoyance. First one must fly to Port Moresby and then on to Hoskins. Port Moresby is most commonly reached via several cities in Australia but can also be reached from Fiji, the Solomon Islands, Singapore, Japan, Hong Kong, and others. Air Niugini is the national airlines and has the most flights within and out of the country. Baggage restrictions can be strict on Air Niugini, but booking with a travel agent or making an international connection may help. Carry on restrictions are strictly enforced on flights departing from Australia. Read about how to beat airline baggage fees. It was a fantastic trip, and while there are seemingly endless destinations that I want to visit, I hope to one day return and do this trip again. While there was some similarities in the diving to other places (Komodo Islands, and the Solomon Islands come to mind) there were more differences, and I found it to be very unique from any other trip I have been on. I remain astounded by the way we would go from one high action site to another over and over again. I can still see myself in my mind's eye sitting there 60 feet under at Krakaphat with soft corals directly in front of me and looking up past the corals to see a school of jacks about thirty feet away just as a turtle swims overhead. And remembering that makes me happy. 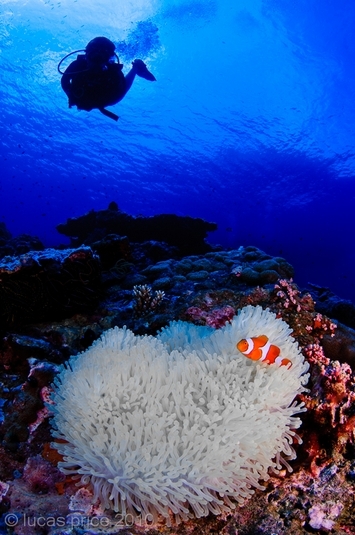 Resort or a liveaboard for underwater photography?